A custom painted SUV isn’t something you see everywhere. 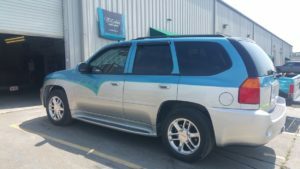 It all started when we decided to put a TD Customs decal on the back of my car – a white 2008 GMC Envoy Denali. I figured I might as well advertise a little while I’m driving around town. That could have been it, but we got to thinking, wouldn’t it be cool if it were a little custom though? After all, custom paint jobs are what we’re all about. Initially, my idea was to simply sand off the clear and apply a new clear coat with rainbow metal flake. The same metal flake that is on Tim’s shop truck. We’ve painted rainbow metal flake on a white car before. In the shade, it still looks basic white, and then in the sun it pops and looks cool and sparkly. I tend to like things a little more subtle, especially since it’s just an average Envoy SUV. 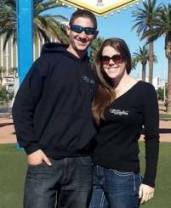 But as most of our personal projects go around here, we brainstormed and thought of a little more we could do. While it’s all ready for a paint job anyway, should we do anything else to it? Maybe add another color and two tone it? 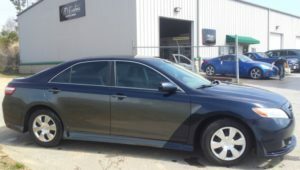 A little less than a year ago, we painted my Camry a custom two toned blue and silver. We had put a body kit on it, and I loved the look. Until it got rear ended at a traffic light, and was totalled. That’s when we got the Envoy, but didn’t have any real plans to make it a custom painted SUV. We started brainstorming what a two toned white and blue paint job would look like on the SUV. Erick, our most experienced body tech, suggested pearl white on top. Pearl white also sparkles in the sun and can look different colors/shades in the light. At this point, we weren’t sure the rainbow metal flake on the white would look good up against the blue. We weren’t painting the inners and door jambs like we do with most full paint jobs. The reason for this being we didn’t want to take the car apart and create more work. This isn’t a customer’s vehicle, so we decided on a quick paint job that wouldn’t take up as much time. 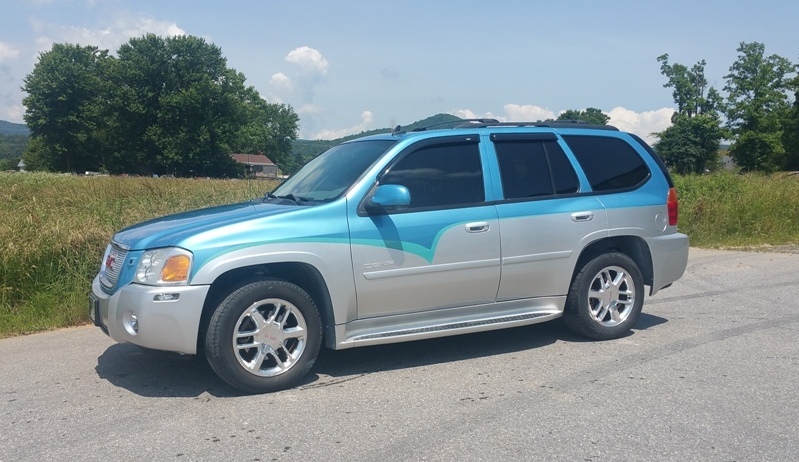 For this custom painted SUV, we painted it blue on top, and silver on the bottom, with a teal strip dividing the two. We drew the tape lines exactly where we wanted them to create the custom strip look that dips down in the middle. The door jambs, under the hood, inside the trunk, etc. are all still white and go well with the exterior paint. Because we didn’t take any parts off the car, the guys had it sanded and prepped for paint in less than a day. 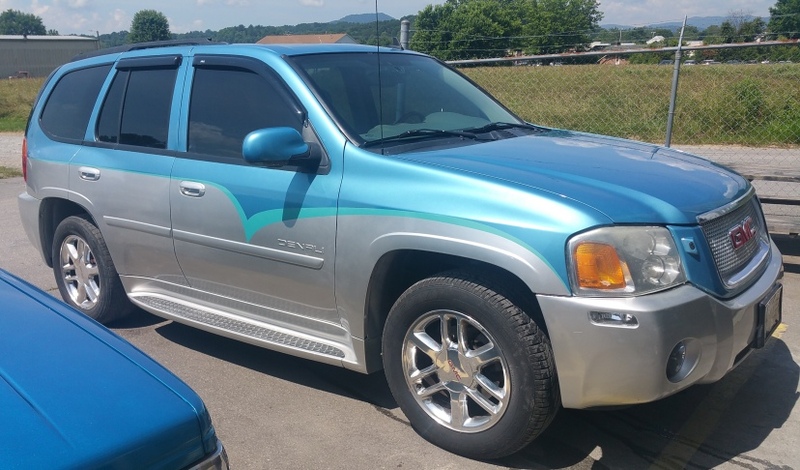 A two toned paint job on a 10 year old SUV goes to show you don’t need a classic car or some high end vehicle to justify customizing it how you’d like it. We’ve done paint jobs on all sorts of vehicles. Some are classic or high end, but others are just nostalgic or loved by their owners. If you’re going to drive it every day, you might as well love the look. Contact us if we can help give your vehicle the makeover you’ve been wanting. No Replies to "Custom Painted SUV - Basic No Longer"